A fiberglass Repair Instructional - how-to boat repair video to help those who want professional gelcoat spot repair or minor fiberglass repairs. Why waste money on a gelcoat repair course? That may only steer you in the wrong direction, for just a few dollars you can learn more technical information and the best method for a 5 star repair using my easy to follow system. Use the same knowledge, same mix and same materials for a complete over-all refinish by using a regular automotive spray gun instead of a preval sprayer. Everything you need to know to accomplish first class, gelcoat repair and fiberglass repair with no disasters or complications in just 1/2 hour. Easy for anyone also excellent for fiberglass specialist using older techniques ready to change systems. Technical support for any fiberglass repair projects including fabrications available at any time! Reference manual attached to the front cover highly detailed-12 page with pictures and full text to help guide you through spraying gelcoat over your scratches, chips, air voids or fiberglass repair. Use the material list inside the manual and bring it with you when purchasing the materials. Tint guide included to help get you tinting gelcoat with confidence in no time. Advance your knowledge and utilize the instructional by reading information on the Tips page of this website by following the Instructional carefully and reading the tips page takes away any guess work for all types of repair. 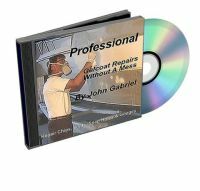 I know this trade inside out upside down and back to front with that said: I have helped hundreds of individuals become experts almost instantly with this fiberglass repair instructional, including boat manufacturers changing over to my system, so why not learn how simple it is to do your own first class gelcoat repairs? In my video you will learn the best products to use for any fiberglass repair project. 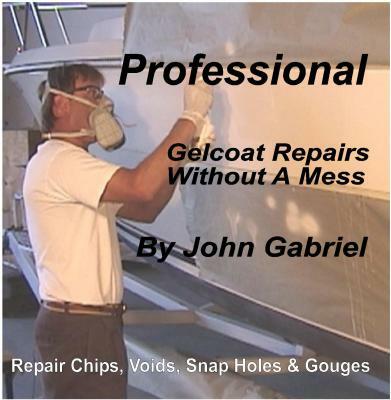 Learn gelcoat repair and be amazed of your boat hull repair accomplishments. You can get started today! as a leader in Boat Hull repair and the construction for over 37 years I am here to help you aquire a smooth, no stress repair.